How do Hydraulic Tools Work? A Hydraulic Torque Wrench is made of 3 parts: the square drive Wrench and a Hydraulic Pump plus a Hydraulic Hose to connect them. Within the tool is a Hydraulic Cylinder, similar to a typical Double Acting lift Cylinder on a Hydraulic Ram. The Cylinder pushes a ram inside the tool against a cog, then releases and retracts, then pushes again and retracts. By pushing the cog this turns the square drive thus turning the nut. The special valve on the Hydraulic Pump uses high pressure to push (advance) the ram and low pressure to return (retract). The torque is controlled by setting the Pressure on the pump and operating the wrench until it stalls (stops turning). A "torque-chart" showing a pressure-to-torque relationship gives you readings for specific tool sizes. A typical torque-chart for a IBT-3 Tool example. The higher the pump pressure, PSI, the higher the tool output. When torquing up fasteners simply ratchet the wrench until it stalls - until it stops turning. To undo bolts reverse the square drive and use the max pressure setting of that tool. Every wrench has accuracy of +/-3% throughout its full range. Difference between a Pneumatic Nutrunner Wrench and a Impact Wrench or Rattle Gun. The typical Impact Wrench uses air to drive a spindle around via a hammering mechanism. Thus the word "Impact" means the hammering action has an impact on the nut to turn it. The name Rattle Gun comes from the sound of the hammering and vibration created. A RAD Pneumatic Nutrunner Wrench does not impact or hammer the nut to turn it. Instead an air motor turns a set of multiple gear stages, to "Multiply" the torque generated through the air drive motor. The motor may turn at 500 RPM with the gearing resulting in the square drive RPM of 25, thus creating higher-torque than the air motor alone can produce..
Impact Sockets are designed and manufactured to cope with the high torque pressures that are applied by hydraulic & pneumatic wrenches. We only recommend Impact Sockets for high torque bolting. We offer a big range of Impact Sockets and Hex Drivers. Difference between the Square drive and Hex Cassette Low Series Hydraulic Wrench? 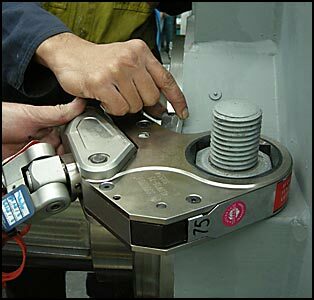 A Square Drive Hydraulic Tool use impact sockets to engage fasteners. Similar to a standard socket set operation or a hand operated square drive wrench. Although compact and versatile in shape it cannot fit every application. The Low Profile Hydraulic Wrench is designed to fit anywhere a Ring Spanner will, thus it comes in individual Hex sizes called Links, just like Ring Spanners. The Hex Links fit over the nut like a ring spanner. Its thin design allows it to fit in awkward situations that other tools cannot. The Low Profile series is primarily for limited space applications. The tool basically solves problems of access! If you have a obstruction to getting a tool onto a bolt then this is the Tool for you. Also it fixes the "Long Bolt" problem! If a bolt is too long for a Deep Socket, then the Low Profile Series tool slips over and down the bolt to the nut - see image at right. The WREN IBT Series square drive is the real workhorse of workshops around the world. It offers users the versatility and compact size-to-power to tighten and loosen the most difficult fasteners. This tool is your tool of choice for most heavy industry shutdowns and maintenance. Start with knowing the Torque required. Pick a tool with that required Torque in the middle of the tools range. Generally, a torque wrench should have 50 per cent more capacity than required for a particular application. That leaves plenty of capacity in reserve when necessary for cracking difficult bolted joints. For heavy applications, wrenches of twice the capacity are often used. What impact and noise do these wrenches make? There is NO impacting of bolts with a Hydraulic Wrench. It is powered fully by fluid movement and does not create any vibration or noise problems. The WREN Pumps are one of the quietest in the industry, and been tested in some of the harshest conditions thoughout the Australian Mining Industry. Every wrench is Calibrated to NATA Standards. Every Torque Wrench is been torque tested and Calibrated every 12 months. All tools are factory tested, then tested again in our workshop before being delivered. Hire is the best testing ground! Lots of our clients Hire equipment first, then quickly ask about purchase. Our Australia wide Workshop Network has a full range of tools for every application. Not only do we Hire and Sell, but our long experience with high torque tooling offers advice second to none. We'll solve your bolting problem safer and faster than anyone! We hold a large inventory of Wrench models and Spare Parts and Impact Sockets. Hire & Sales - Based in Melbourne Victoria, we Deliver Hydraulic Torque Wrenches & Air Nut Runners across the country - Australia Wide!